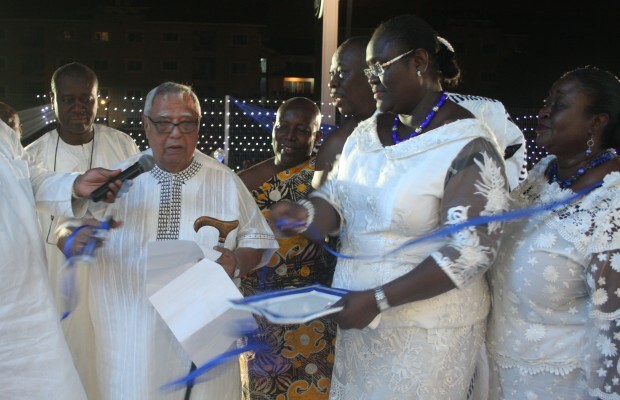 A 7-storey ultramodern edifice was on Thursday commissioned in Accra off the 37 Military Hospital– Airport road to commemorate the late Oyeeman Wereko Ampem II, chief of Amanokrom and Gyasehene of the Akuapem Traditional Area, who died 10 years ago. The building, christened ‘The Grand Oyeeman’, was officially opened by Ramchand Udharam Mohinani, founder and Chairman of the Mohinani Group of Companies. Currently, the building houses showrooms for automobile dealers Land Rover and Jaguar, among others. Speaking at the thanksgiving service organized to mark the 10th anniversary of the late chief at Osu Ebenezer Presbyterian church the same day, Rev. Victor Oko Abbey, Chairperson for Ga Presbytery, urged Ghanaians to celebrate and acknowledge great people in society before they die. Rev Abbey recounted that Oyeeman Wereko Ampem II was not only a renowned chief of Amanokrom but wise advisor and counselor, statesman and policy maker. Born on October 29, 1930, Oyeeman Ampem II died on November 26, 2005, aged 75. He was enstooled on August 4, 1975 and reigned for 30 years. He was an economist, statistician and business executive known in private life as Emmanuel Nii Noi Omaboe. “You cannot talk about the Statistical Service of Ghana, the Ministry of Finance, leadership and administration of the University of Ghana and the Ghana Medical School, and the United Nations, among other organizations, without mentioning the young E.N. Omaboe. Oyeeman was also a staunch member and one of the key leaders of Accra Hearts of Oak,” he added. The event brought together family and friends of the Oyeeman Wereko Ampem II as well as several dignitaries.